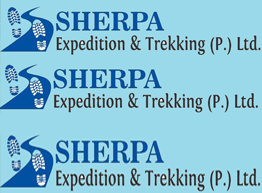 Why Sherpa Expedition & Trekking? The Sagarmatha National Park has been a popular and one of the best destinations for the climbers and trekkers since the first south expedition to Mt. Everest on 1950. Trek is an adventure trek of Nepal which includes the crossing of the Renjo La pass (5360m), Cho-La pass (5420m), Kongma-La Pass,(5535m) and other attraction for the trekkers such as Gokyo Ri (5,360m), Fifth Lake in Gokyo valley, Kalapathar (5,545m) and Everest Base Camp (5,320m) . The amazing landscape views during the trek is unbeatable. More importantly, you should be physically fit to complete these passes. The three passes trek offers unique views of four giant mountains above 8,000m; Mt.Cho Oyu (8,201m), Mt. Makalu (8,463m), Mt. Lhotse (8,516 m) and Mt. Everest (8,848m). This trekking introduces us to the remote valley named as Nangpa La, monastery village of Thame and the Sherpa village of Marlung. We steep up all the way to Dingboche 4410 m for Kongma-La Pass 5535 m via Tengboche 3860 m. Khongma-La pass gives a lifetime memories of panoramic views of the spectacular Himalayas. Kongma-La Pass is the highest pass among these three passes with an altitude of 5535 m. From Dingboche, we again ascend up and after crossing Khongma-la via High Camp we reach to Lobuche 4910 m. From Lobuche, we continue our trek to Gorekshep situated at the height of 5140 m. Gorekshep is a junction point to Kalapathar and Everest Base camp. For the close and unbeatable view of Mt. Everest we take our way to Kalapathar. Later we descend through the same route to Gorekshep and from Gorekshep we take the ascending trail to Everest Base Camp through the once vast Gorak Shep Lake. Continuing the trek, we climb up toward The Everest Base Camp 5365m from where we can see the hazardous route of Everest i.e. Khumbu Icefall by which brave climbers pass through. From EBC we descend to Lobuche and we will chase to Cho-La pass 5420 m. This pass is the hardest pass among all three. It starts nearly from Lobuche Kharka and ends at Thangnak. On the way to Thangnag Kharka via Dzonglha 4830m we see the Awi peak 5245 m, Lobuche Peak, Nirekha Peak and many more. 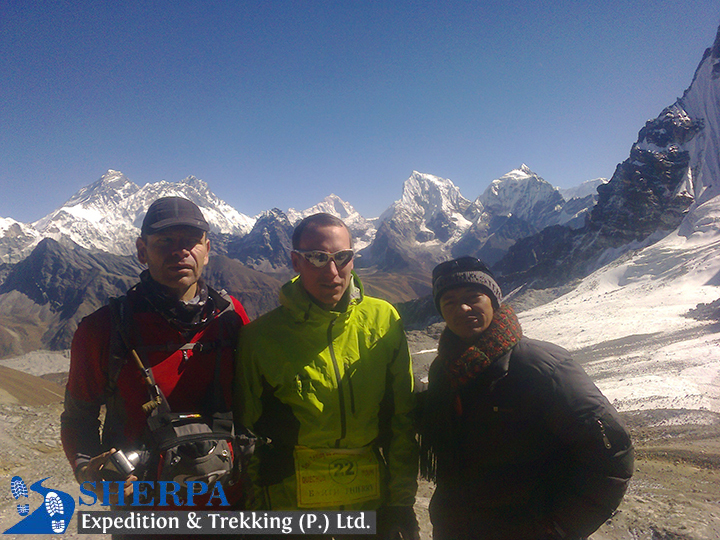 After exploring the places of Everest Region, our trek continues to Gokyo. Trek to the fourth and fifth lakes would be an extra attraction in Gokyo Valley from where the views are amazing. Then We climb the Gokyo Ri, The Gokyo Ri 5330 m is considered as the best viewpoint of the entire Himalayas in the Everest Region. Now, we ascend our way to High Camp through Renjo-La pass 5360 m. Renjo-La pass offers us a lifetime memory of panoramic scenery of Himalayan range. From High Camp, we descend all the way to Thame via Lungdhen 4380 m and Murlung 4210 m. Then we trek down to Lukla via Namche Bazaar making a circle to complete the 3 passes and trip in the Himalayas complemented by the hundreds of memories and a huge sense of accomplishment. The three pass trek is the ultimate Everest experience. Amazing view of world highest mountain. Cross the three challenging 5,000mm passes Renjo La, Cho La, and Kongma La. Attractions to see in Everest three pass trek: Lifestyle of Sherpa people, their typical culture, language, and Buddhist religion. Eco Teahouse Lodges room managed by the local community. 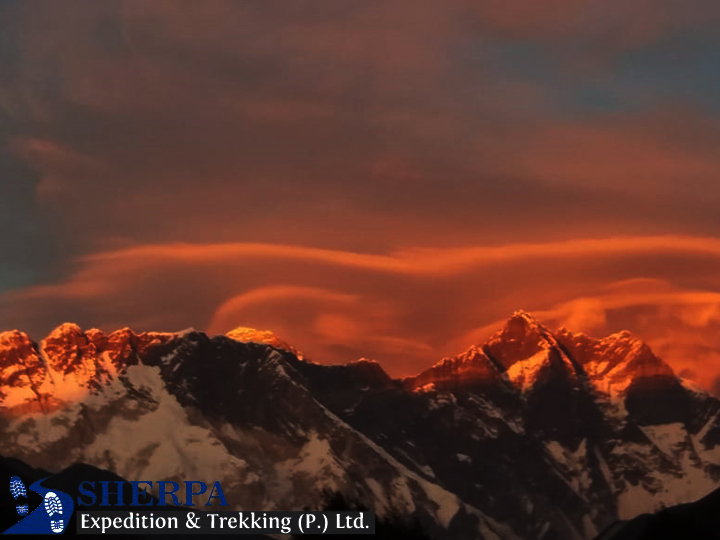 The above information is Sherpa Exp Trekking a guide and a standard template of what we provide. Our Sherpa’s team provides a trip can be customized at your request to accommodate your specific requirements. Sherpa Exp & Trekking company families inform that’s; Lukla Airport is situated on a wonderful valley surrounded by high mountains. Due to this reason, landing and taking off from Lukla is considered to be difficult and technical. The weather in the area unpredictable and is likely to change every few hours resulting in flight delays or cancellation. Twin Otter and Dornier planes are the primary mode of transport to and from the airstrip at Lukla. This service is fairly dependable. However, if flights are canceled due to mountain weather conditions, to Lukla or from Lukla to Kathmandu, we will help you charter a helicopter to ensure you are on schedule for your trip and international flight connections. The extra charges incurred are approximately $2,500 to $3,000 USD per helicopter (USD 500 to USD 3,000 per person) would be applicable to you for the helicopter charter. The helicopter takes 4 to 6 passengers at a time and the cost can be shared amongst the passengers. The cost must be paid by the participant, which can later be submitted for reimbursement through the travel insurance company. We can help you with the necessary documents for a claim. Payment for the helicopter must be paid at the time of service by the participant. US dollars cash or credit cards (Visa Cards, Master Cards, American Express) are accepted for helicopter transport. Any card payment requires a 4% bank fee, which goes directly to the bank. The helicopter can fly if the visibility is 1500m or greater, while the twin otter and Dornier planes can fly if the visibility is 5000m or greater, as per Nepal’s Civil Aviation rules. If the weather is extreme and the visibility is lesser than 1,500m helicopters are also not operated. In such cases, we will reschedule your flight for the next day depending on the availability. If this situation keeps on getting repeated for many days then you would be provided with the alternative trek options. Day 1: Arrival in Kathmandu and transfer to hotel. Arrival at Kathmandu Tribhuvan International Airport, received by Sherpa Expedition and Trekking staff with a warm welcome and transfer to respective hotels with a briefing regarding Everest high three passes trek, hotels, lodge on the route with doing and don’ts with evening group welcome dinner. Day 2: Lukla (2850m) - trek to Phakding (2610m) – 35 minutes flight 4 to 5 hrs walk. After breakfast in the hotel, we drive to the domestic terminal of Kathmandu Airport for the 30-minute flight to Lukla. Landing on the narrow, sloping runway high above the Dudh Koshi River in the heart of the mountains is a very spectacular way to arrive. 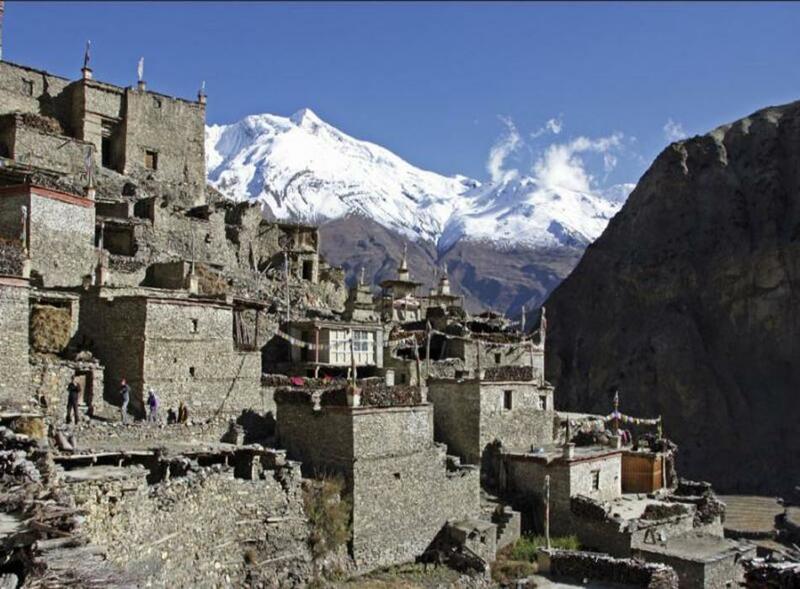 We will be staying 2 nights in Namche Bazaar to acclimatize. After meeting our porters we will take lunch at the Yeti Mountain Home Lodge and then start our trek with an easy, mostly downhill leg, from Lukla to Phakding. 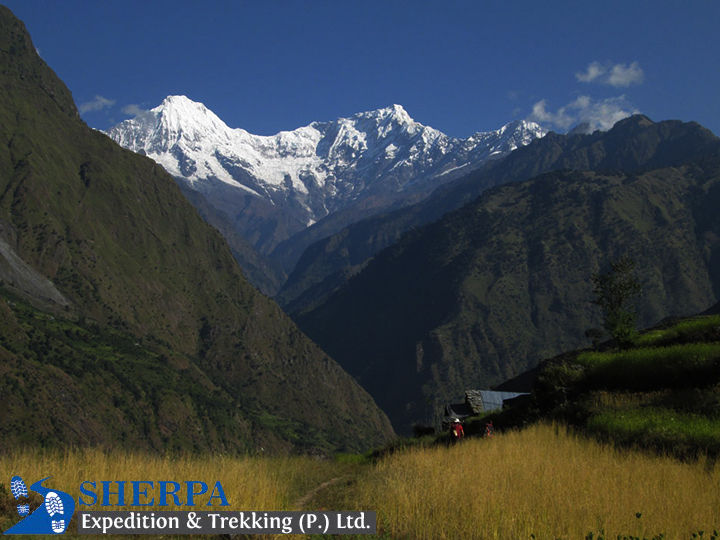 This trek takes us through pastoral lands of the Sherpas and we pass several small villages and individual farms. Many Sherpas now make their living exclusively from trekking and there are also many tea houses and basic lodges where it's possible to stop for a drink or a chat. We will also pass by many stones intricately carved with prayers in the evocative Tibetan script, and prayer wheels of all sizes. Everywhere in the valley colorful strings of prayer flags flutter from high points and bridges. After 2-3 hours of trekking, we finally meet the river and reach our first lodge at Phakding located beside the tumbling Dudh Koshi. The altitude at this first stop is actually lower than Lukla at 2610m. Included meals: Breakfast, Lunch, and Dinner. Day 3: Trek to Namche Bazaar 3,440 m - 05 hrs. Walking through a beautiful pine forest, the track leads us along the Dudh Koshi River through many suspension bridges, one of which is the famous Hillary Suspension Bridge. First, we catch wonderful prospect of the glistening Mt. Thamserku (6618 m). Through the settlement of Benkar, Chumoa, Monjo, we come to the check post and entrance to Sagarmatha National Park. We pass through the last village of Jorsale before reaching Namche Bazaar. The trail climbs through the forests and bridges until we reach the confluence of the Dudh Koshi and Bhote Koshi rivers. After a final steep ascent of about two hours, we get first sight of Mt. Everest peering over the Lhotse-Nuptse ridge. Upon this juncture, we stop at Chautara to admire the view. We still need to hike about 1.5 hours to reach Namche Bazaar, a gateway to Mt. Everest and main trading center of this region. We stay overnight in Namche Bazaar. Included meals: Breakfast, Lunch, and Dinner. Day 4: Rest day at Namche Bazaar for acclimatization and excursion. This is the first of the two days set aside for "acclimatization". Health experts recommend us to stay active and moving during the rest day too instead of being idle. We either spend the day taking a day's hike to Thame or visiting Khunde or relaxing and exploring Namche Bazaar itself. Namche Bazaar is the main center of the Everest (Khumbu) region and has government offices, ATMs, Internet cafes, shops, restaurants, a bakery, and a colorful market each Friday evening and Saturday. If we trek a few hundred vertical feet during the day, it will help us to properly acclimatize. Our guides take us to the Tourist Visitor Center near the headquarter of the Sagarmatha National Park where we can observe an assortment of things related to the first Everest ascenders, Sherpa culture and learn about the various plant and animal life of the Everest region. Included meals: Breakfast, Lunch, and Dinner. Day 5: Trek to Tengboche 3,867 m 5 to 6 hrs. Upon breakfast in Namche, we set out towards Tengboche, enjoying the superb view of Mt. Everest, Mt. Nuptse, Mt. Lhotse, Mt. Ama Dablam and close up view of Thamserku. Our trek follows a more or less smooth trail with few ups and downs which will not bother us as the magnificent view of the Himalayas keeps our company all through the journey. Along the way, we can spot wildlife musk deer, a herd of Himalayan Thar and multicolored pheasants. The trail goes gradually down up to Kayangjuma. The path eventually reaches Sansa, which is the major trail junction to Gokyo valley and Everest Base Camp. The track then follows through the pine forests and after we cross the prayer flags festooned bridge over the Dudh Koshi River, we reach Phunki Thenga, a small settlement with a couple of teahouses and a small army post amidst the alpine woods. After having a relaxed lunch at Phunki Thenga, we gear up for a slightly tougher climb through the pine forests before we reach Tengboche. Tengboche is a great place for close up views of Mt Ama Dablam, Mt Nuptse, and Mt Everest, and it has the biggest Buddhist Monastery of the Khumbu region. We pay our visit to the monastery the same day at around 3 pm to witness the ceremony in the principal and popular monastery of Everest region. Overnight stay at a lodge at Tengboche. Included meals: Breakfast, Lunch, and Dinner. Day 6: Trek to Dingboche 4,260 m 4-5 hrs. With mountains at its backdrop, the monastery at Tengboche looks more spectacular in the morning. At this juncture, we can take pictures of the monastery and the scenery around and as usual start the day journey. We choose the upper trail for better views on the way to Pangboche village. We pass through several Chortens and Mani walls and small villages. The place where we stop for lunch not only serves delicious food but also allows a fantastic close-up view of Mt Ama Dablam. In the afternoon, we walk north to Pheriche or take the eastward trail beneath the towering north face of Mt Ama Dablam. From here onwards, the walk is fairly moderate as we enter the Imja Valley. The valley gradually unfolds as we approach the confluence of the Lobuche River. We descend into the river and begin the last and steepest climb of the day up to Dingboche. On arrival at Dingboche, we will see a beautiful array of fields enclosed by stone walls to protect barley, buckwheat, and potatoes from the cold winds and grazing animals. Overnight at Dingboche.Included meals: Breakfast, Lunch, and Dinner. Day 7: Rest day at Dingboche for acclimatization and excursion. Another rest day for proper acclimatization, a short hike to Nagarjuna hills for best views of Mt. Makalu and other adjoining. Included meals: Breakfast, Lunch, and Dinner. Day 8: Trek to Chhukung 4,750 meters 4 to 5 hrs. From Dingboche a short walk to Chhukung last settlement of Khumbu area around Imjatse Valley with grand scenery of snowcapped mountains with Mt. Makalu towards east. At Chhukung afternoon free or hike to Chhukung Ri for more super views of the mountains and preparation for next early morning adventure towards Kongma-la pass. Included meals: Breakfast, Lunch, and Dinner. Day 9: Trek to Kongoma-la 5,535m and to Lobuche 4,928m 7-8 hrs. After the wonderful stop in Chhukung, a Big Day! Start early before dawn with a climb on the icy path, walking on rocky trail beneath Kongma-la and its peak Kongma or Mehra, after a good rest, cross over Kongma-la pass at 5,535 m / 18,159 ft hidden between great Nuptse wall, Mihara and Pokalde peaks. After a tough climb towards Khumbu glacier and moraine one has to be careful here on the misleading after descending the walk leads on the path to a short steep climb up to the terminal debris of Khumbu Glacier to reach at Lobuche for an overnight stop in the comfort of a cozy lodge after great full day walk. Included meals: Breakfast, Lunch, and Dinner. The trek to Gorakshep goes ahead through the lateral moraine of the Khumbu Glacier. We pass through the pyramid signpost. Ahead on the trail we see the crest of the north ridge of Everest along with Mt. Pumori, Mt. Mahalangur, Mt. Lingtern, Mt. Khumbutse, Mt. Nuptse, etc. A small ascent would take us to ThangmaRiju from where we perceive 360-degree vista of snowy mountains. Climbing steeply up to the top through the torrent of Changri Glacier, we catch our first glimpse of Kala Patthar, a grey-green knoll beneath the Mt. Pumori. As we reach Gorakshep, we will find snow-capped mountains looming all around us including the top of the world - Mt. Everest. Included meals: Breakfast, Lunch, and Dinner. Day 11: Hike to Kalapatther 5,545 m/18 and walk to Dzongla 4,830 m 5 to 6 hrs. Early hike to Kalapatthar hilltop, a black rocky ridge at 5,545 meters high, offering the panorama of surrounding giant peaks with Mt. Everest at close distance, then head back to Gorakshep, continue trek downhill to reach the base of Cho-la pass at Dzongla for an overnight stop. Included meals: Breakfast, Lunch, and Dinner. Day 12: Dzongla to Cho-la pass 5,367m/17604ft, walk down to Thinktank 4,750 m 6 to 7 hrs. Early in the morning as we start our trek to Thangnak, the fantastic view of Cholatse mountain greets us. The trek starts as we steep up to the westward from Dzonglha. Today is the day we conquest Cho-La pass and the trip will be toughest than before. As we reach on the top of the basin we prepare to cross the Cho-La. The of Cho-a lake and the Mt. Amadablam could be seen during the trail which reduces our tiredness. Now climbing is not so easy and we also to be alert as rocks can be glazed by ice. The final climb is little technical as the trail curves around. After reaching on the tip the path leads us downhill to Thangnak which can be easily done. Included meals: Breakfast, Lunch, and Dinner. Day 13: Trek to Gokyo 4,750 m/15, 580ft 3-4 hrs. Day 14: At Gokyo rest to visit the fifth lake and climb to Gokyo Ri 5357m/ 17570ft 5 to 6 hrs. Morning an option for a hike to Gokyo Ri at 5,357m another highlight of this adventure, Gokyo Ri offers breathtaking scenery panorama of world’s highest peak from Mt. Cho Oyo, Gyachung Kang, Mt. Everest, Mt. Lhotse, Cholatse, Taweche and to the east Mt. Makalu. After a grand vista descends to Gokyo and marvels the surrounding awesome views. Another option excursion to Gokyo 5th Lake 5 hours of round trips, needs pack lunch as the walk leads at the base of Cho-Oyu world 6th highest mountain straddles the border with Nepal / Tibet, with views of Mt. Everest, Changtse and towering ice wall of Cho-Oyu. Included meals: Breakfast, Lunch, and Dinner. Day 15: Gokyo to Renjo-la 5360m/17585ft, and descend to Marlung or Thame 4,210m/3880 m 7-8 hrs. Last 3 high pass of this adventure a Big Day! starting before dawn leaving Gokyo towards the last pass of this adventure, walk follows the path at the end of Gokyo Lake, the route to the pass offers marvelous views of Mt. Everest, Lhotse, Cholatse and Taboche, and then crossing Renjo La pass at 5,465 m / 17,929 ft, one of the most difficult section of this adventure, on reaching the top with breathtaking panorama of Mt. Cho-Oyu and other high surrounding peaks, after enjoying the views. After a pleasant break walk follows leading to frozen ponds beneath Renjo La pass, and then a long descend reaching a small settlement at Lungdeng which is near to Nangpa-la pass towards Tibet. The walk continues to reach Marlung village for overnight stop above Bhote Koshi River up streams. Included meals: Breakfast, Lunch, and Dinner. Day 16: Trek to Monjo 2,860m via Namche Bazaar 5-6 hrs. After reaching outskirt of Thame village a short uphill and gradual walk to Thamo with hydropower of Namche and other Khumbu villages, a good walk leads back into green woodland of tall pines and rhododendron tree lines as the path approach to Namche Bazaar. From here retrace the journey back to Monjo near Sagarmatha National Park gate for an overnight stop. Included meals: Breakfast, Lunch, and Dinner. Day 17: Trekking from Namche to Lukla 6-7hrs. Morning walk reaching at Phakding from here retrace the journey back to Lukla with the last climb, on reaching Lukla celebrate last night dinner with fellow trekkers and staff. Included meals: Breakfast, Lunch, and Dinner. Today, we fly back to Kathmandu after our long mountain journey. The early morning flight drops us in Kathmandu. We can rest and relax throughout the day at the hotel. To celebrate the successful completion of our journey. Included meals: Breakfast, Lunch, and Dinner. Today, last day in amazing Nepal with great experience and fond memories of Everest High Three Pass trekking, as per your time for international flight, Sherpa Expedition and Trekking staff transfer you to the airport for your final departure homeward bound or to your next destinations. Hotel / Airport pick up & drop off by private car / van / bus. Accommodation in Kathmandu as mentioned in the itinerary. Standard twin sharing accommodation in a three-star hotel in Kathmandu; Breakfast included. Flight from Kathmandu to Lukla and back to Kathmandu. Local staffs and porters to carry your luggage during the trek. Down jackets-sleeping bags and comprehensive medical kits. Food, accommodation, salary, insurance, equipment, and medicine for all staffs. Sagarmatha National Park permits fee. All meals (lunch and dinner) in City or the Capital. International airfares and airport departure tax. Alcoholic, cold and hot drinks, chocolate and laundry. Any others expenses which are not mentioned in the above section. 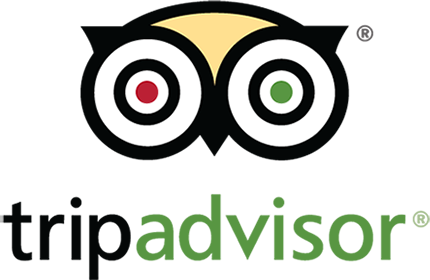 You will be accommodating in a 3-star hotel in Kathmandu. During the trek teahouses/lodges are readily available. Due to excellent infrastructure, the teahouse of this trek is relative of high quality but at the higher elevation or up ahead from the Namche, you will not be able to find a standard accommodation, the rooms are basic normally with a bed, blankets and a pillow. Breakfast will be served in Kathmandu and all meals (Breakfast, Lunch, and Dinner) are included during your trek in the Himalayas. The teahouses of this trek are quite standard and serve you authentic Nepalese food and International cuisines too (Tibetan, Indian, Continental, etc.). Please carry water purifying pills as you get to have stream water also note that you have an option of buying bottled water. The Three Passes Trek is highly rated as a challenging trek than the classic Everest Base Camp Trek so this trek is suitable for trekkers who have had past experience of trekking, this does not mean you need to be an athlete’s or marathon runner. However, the fitter you are, the more you will enjoy it. This may sound difficult to the first time trekkers, who are concerned that they won’t keep up; all you need to do is walking, jogging, cycling, and hiking near the valley before embarking. Trekking in the higher elevation is physically demanding than trekking in the lower elevation. Going up at higher elevation too fast causes altitude sickness, it generally happens when your body fails to adapt to the decreasing amount of oxygen available on high altitude as we ascend higher above 2500m. Allow your body to have sufficient time for acclimatization. Do not travel alone, take a guide or travel with a group of people. Say no to alcohol, sleeping pills, and smoking. At least drink 3 to 4 liters of clean water a day. Do not make rapid ascend. Kongma La & Cho La..
Post Box No: 20969, Kathmandu, Bagmati, Nepal. Copyright © 2019 Sherpa Expedition & Trekking (P.) Ltd. | Powered by Radiant Infotech Nepal.